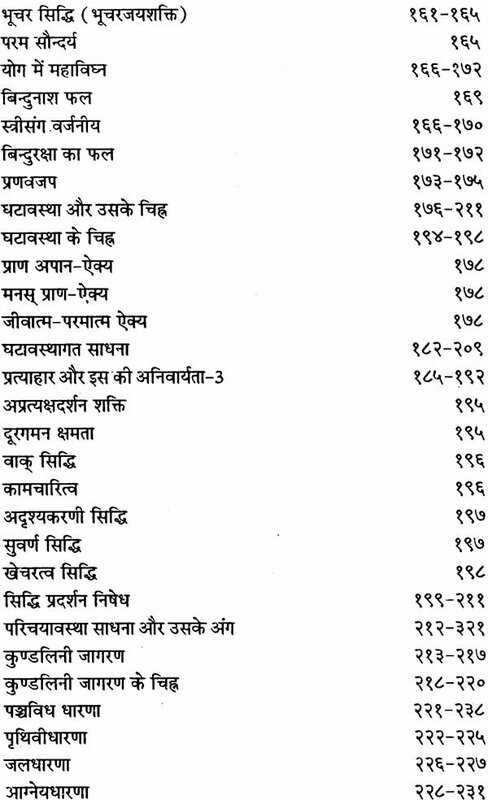 In huge Sanskrit literature, the books published on yoga branch are very little in number. Through ancient times yoga has been considered as a strictly secret subject to be taught only to a deserving disciple. But now time has come to unveil the obscure literature of this occult science to popularise this knowledge in the interest of humanity. The most important work of Dattatreya on yoga was yet unknown to the scholars or sadhakas. 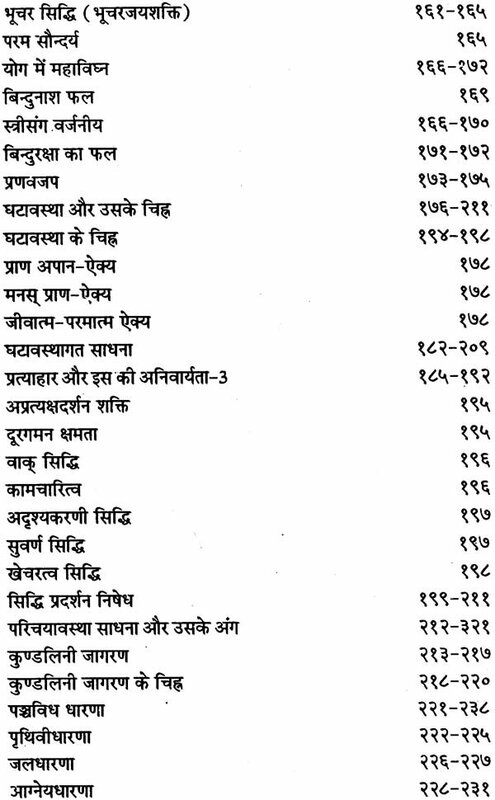 M. M. Dr. Brahma Mitra Awasthi found its copies in Mss. 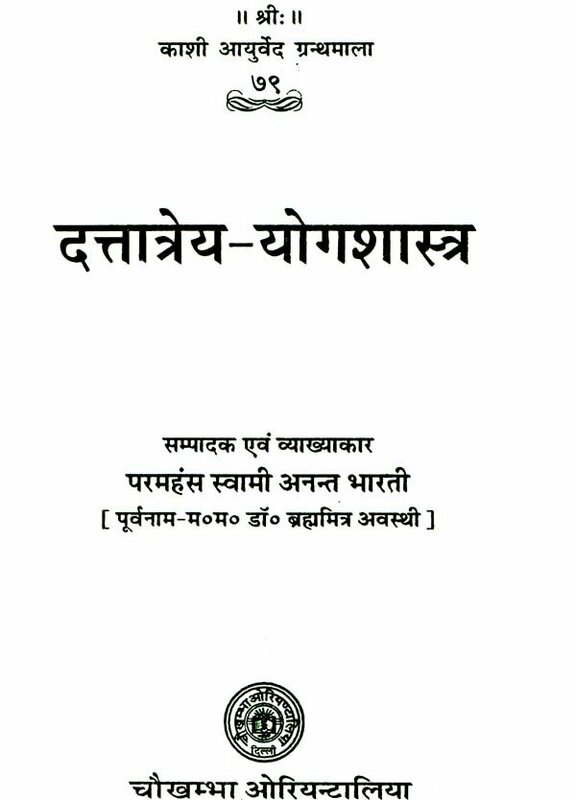 Libraries and edited it with Hindi translation and introduction. This was published in 1982. Now are bringing out it with English translation for the benefit of students unacquainted with Sanskrit or Hindi. 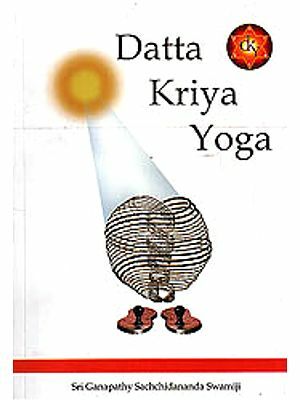 This yoga Shastra is more important than any other books in the field of yoga, because Dattatreya deals with practical aspects of yoga in it, starting from Pranayama to Samadhi. Dattatreya divided Pranayama into four stages viz-Arambha avastha, Ghata avastha, Pravesha avastha and Nishpatti Avastha. He explained clearly all of them and pointed out the Straight way to reach the ultimate goal. He indicated the hardles and Siddhis which may come in the way. Dattatreya advised the way by which a sadhak of yoga can obtain the Pratyahara, Dharana, Dhyana and Samadhi through Pranayama. It also describes important aspects of Layayoga and Hathayoga viz. three Bandhas, Mahamudra, Khechari-mudra and Vajroli etc. 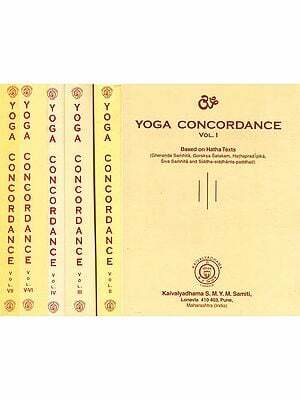 In this way this book is a best guide to a Seeker of yoga. 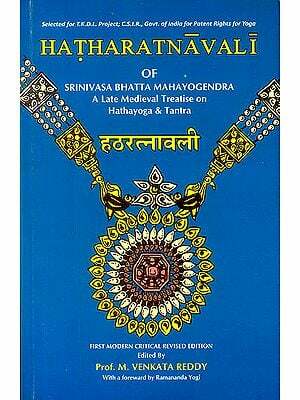 We are deeply indebted to out readers who have shown very keen interest in our first publication-Dattatreya Yogashastra with Hindi translation. We hope that this Hindi & English translation along with the original text of the aforesaid work will be greeted with the same enthusiasm. 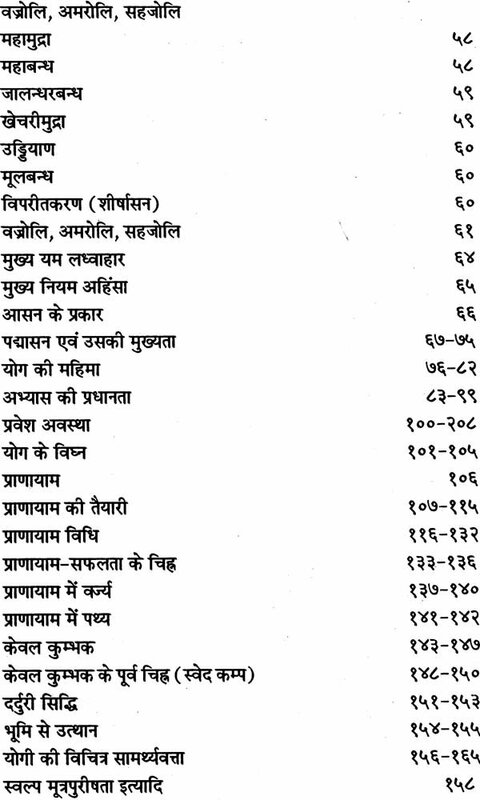 Some other texts on yoga with Hindi and English translations and some original works on Rajayoga sadhana etc. also Published from Yoga Institute. Now Chaukhamba Orientaliya Delhi adopted this work with great enthusiasm. We hope it will be very useful to them who wants to get the straight way for yoga-shadhana to reach the goal of their life. The etymological meaning of the word Yoga is joining or yoking. The action of joining is possible between two or more than two objects. As such the accumulation of two or more objects should be called 'Yoga' where as Patanjali in his Yogashastra has defined it as योगशिचित्तवृत्तिनिरोध i.e. 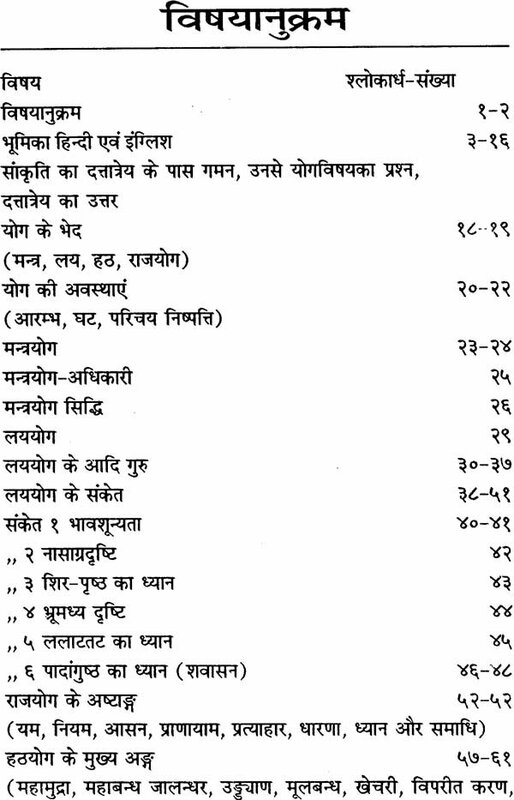 restriction of fluctuations of mind stuff; where' Chitta' is required to be free of any kind of contact with the objects (विषय). These two meanings seem to be contradictory but it is not true in fact. 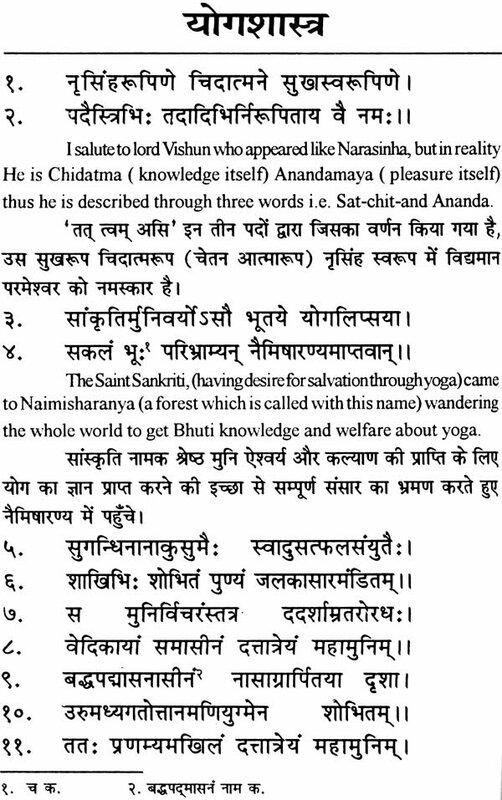 According to Dattatreya the unity of Prana and Apana, Manas and Prana, and Atman and Paramatman is called 'yoga'. Though three yugma ( couple) has been given here but in fact these are interdependent. The unity of second yugma is assisted by the unity of first yugma arid similarly the unity of third yugma is assisted by the unity of second yugma. Thus these three yugmas may be considered as one. As it is essential for the' chitta' to be free of contact with any of the objects while trying to unite the Prana and Apana it is righteous to accept that is no contradiction between the definition of yoga given by Patanjali and the etymological meaning of the word 'yoga'. Keeping this fact in view Panini has thrice mentioned the roots in two different meanings युजिर योगे, यूज सयंमने and युज समाधी. 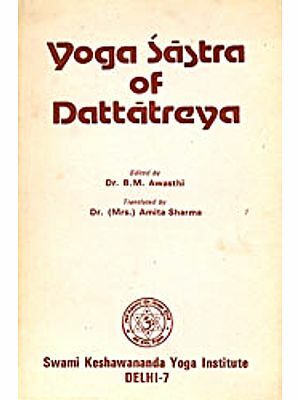 It is difficult to present any historical evidence in support of the date of origin of Yogashastra and its originator. 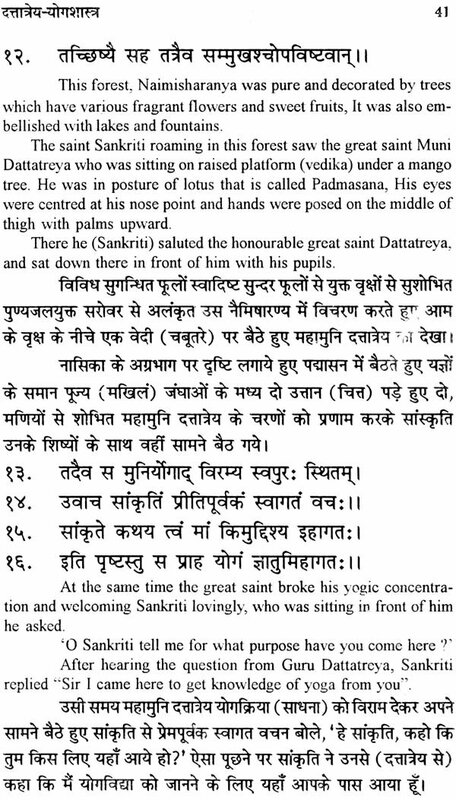 Yoga-sutra of Patanjali is perhaps the most ancient work on this subject. 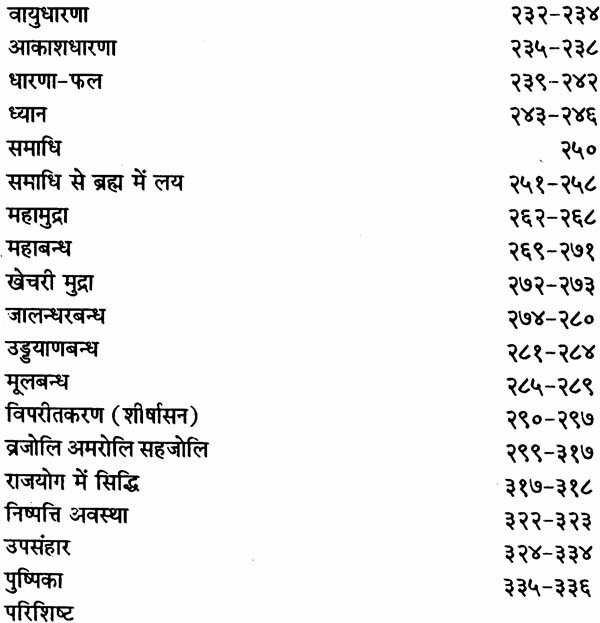 On the basis of some indications given in Yoga-sutras it may be concluded that at least eight schools of yoga were prevalent prior to Patanjali. Lord Buddha also practised yoga while discovering the ways of दुखनाश. 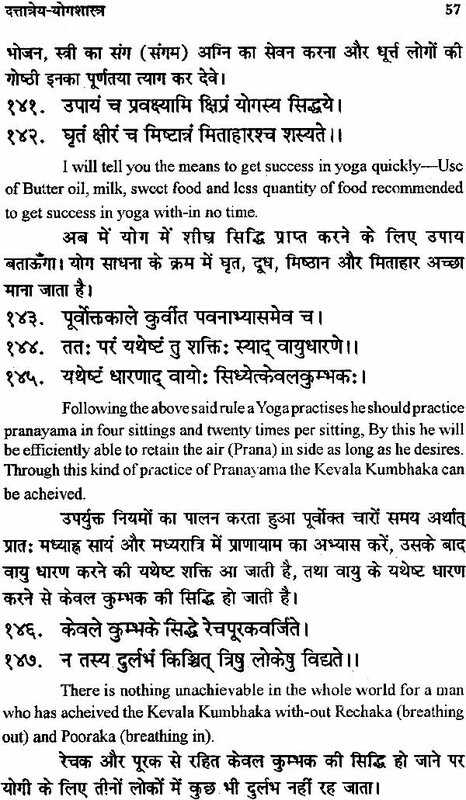 It is evident that yoga was practised two thousand years ago also. A series of yoga Upanishads also proves it as a very old school, though the language of these Upanishads does not seem to be very old. Shiva and some other deities have been depicted as preachers in these Upanishads, Gheranda Sarnhita and Hathayoga Pradipika Though this is not a historical fact, but it is apparent that these deities have some relation with Yogashastra. Here in this Dattatreya-prokta-yogashastra. Shankara has been remembered as the preacher of Laya-yoga by the name of Adinatha. It is not possible to reach on any dicisive point in respect of the above references as neither we find any evidence to accept Shiva a historical figure nor there is any basis to consider Shiva, a deity as the preacher of the Yogashastra. Thus we have to accept that it is not an easy job, though may not be impossible to decide the name and date of the originator of Yogashastra. But it is difinite that yoga with its various branches is prevalent in India through ancient time. Patanjali has given a certain form to these traditional views. Among numerous kinds of yoga, Mantrayoga, Layayoga, Hathayoga and Rajayoga are considered as main yogas. There are some other kinds also like Jnanayoga, Bhaktiyoga, Kriyayoga etc. but these all are incorporated in the above four. The above four are considered to be the supplements of each other. The others even while adopting one of the above paths may intersect before reaching the final goal i. e. कैवल्य. It is therefore but natural that one sector school contains the ideas of others sects or schools. Who is the author of this Yogashastra ? And when was it written? It is not possible to answer these questions in the absence of evidence. On one hand the easy and non-Paninian language of this work proves it quite ancient. But on the other hand its antiquity seems to be doubtful as it is neither referred in ancient yoga granthas nor any commentary is available on it. In these unique circumstances it is advisable to accept that this was popular only among practicants of yoga from ancient times. Since the ways of yoga practice are preached to a worthy and faithful student only, this work remained unknown among scholars. Thus, it is also possible that this work which was prevalent among yoga practicants might have written in its present verse form by any of the disciples of this sect. As far as its non-Paninian language is concerned it is possible that correctness of language was not considered necessary by the writer of this work. Among so many possibilities it is not feasible to take any decision. So it is better to come to the subject matter of this work leaving aside its historisity. Dattatreya has accepted four kinds of Yoga: Mantrayoga, Layayoga, Hathayoga, and Rajayoga. According to Dattatreya the practicant (Sadhaka) of Mantrayoga utters the Mantra keeping their matrikas in its parts. He may achieve Siddhis i. e. Anima etc. after practising this yoga for at least twelve years. According to Dattatreya this yoga is appropriate for a man tender nature and he has named it Adhama yoga. Layayoga is popular by the name of Dhyanayoga. Generally in Dhyanayogait is preached to meditate on the image of the desired God or to concentrate on anyone of the parts body and to absorbe the mind there. According to Dattatreya Adinatha Shankara taught eight crores Samketas of places of concentration. Dattatreya has mentioned some of them in his Yogashastra which are as follows :-Meditation of Shunya which may be called TRANSCENDENTAL meditation. This can be practised every where while standing walking sleeping or eating. Apart of it mind (chitta) can be absorbed by concentrating it on any of the following parts of body in front of nostril, back portion of head, between two eye-brows, forehead etc. The thumb of left or right foot is also a point for concentrating the mind. This should be practised at a lonely place keeping the body in loose position (in Shava-asana). Rajayoga has been dealt with in detail in this work. There are eight accessories of Raj a yoga-Yam a, Niyam, Asana, Pranayama, Pratyahara, Dharana, Dhyana, and Samadhi. According to Dattatreya Acharya Shukra, Guru of Asuras was the originator and first preacher of Raja yoga. Very good book of yoga specially in three language.